Without exception Agromyzidae larvae live in green plant tissue. As an adaptation to this mode of life the females have a strongly sclerotissed ovipositor, that enables them to deposit their eggs inside the plant tissue, rather than on top of it. 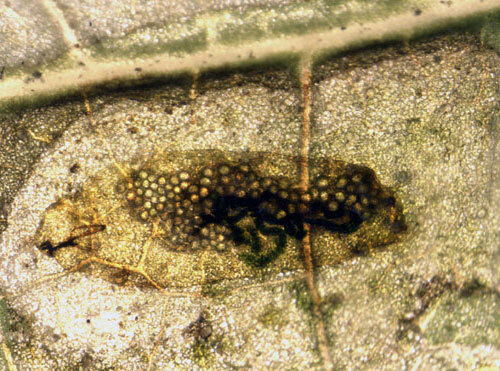 Only about fifty percent of the species are leafminers. Other species live in the bark of stems, or live in deeper tissues, in particular the pith of stems, in developing wood, or even in fruits and underground parts. Agromyzidae mines generally can be recognised with ease by the following combination of characters: mines shallow, frass in two rows, presence of feeding punctures (see below), often the presence of feeding lines, and the larvae being maggots. The larva are more or less banana-shaped and lie (therefore?) on their side in the mine, turning now and the from one side to the other. The effect is that frass is deposited alternatively in two rows of granules or threads. This pattern is especially clear in narrow galleries; in wide blotches the regularity is soon lost. Feeding punctures are lesions, the size of a pin-hole, made by the females with their ovipositor, in order to drink the oozing cell sap. The punctures each leave a permanent scar. They can appreciably damage a plant, that may become seriously weakened (Parella ao, 1985a). Bethke & Parella (1985a) give a detailed account of the behaviour during the making of these punctures. Feeding punctures are not only made by Agromyzidae; also species of the genus Scaptomyza (Drosophilidae) make them. Curculionidae and relatives also may make numerous small punctures, but use their mandibles for that purpose. Liriomyza strigata: the ovipositor is obliquely inserted into the leaf; next the wound is enlarged by making a wagging movement. Insect larvae living in an oxygen-poor atmosphere often bind the carbon dioxide that results from their respiration by the formation of calcium carbonate. Generally this is precipitated in the Malpighian tubes, but Agromyzidae have the unique property to store the calcium in the form of countless lens-shaped discs that are scattered in the fat (Keilin, 1921a). Possibly this stored calcium plays a role in strengthening the wall of the eventual puparium. When a larva dies in the mine the calcium discs remain recognisable for a long time. But also in living larvae they are quite conspicuous under the right illumination. In most cases the larva leaves the mine when pupation is at hand. 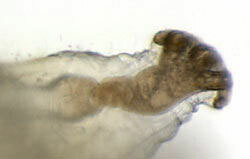 Often the vacated mine shows the semicircular exit slit that the larva has made in the epidermis. Sometimes, perhaps often (that remains to be studied) the position of the slit in either the upper or the lower epidermis is a constant specific character. 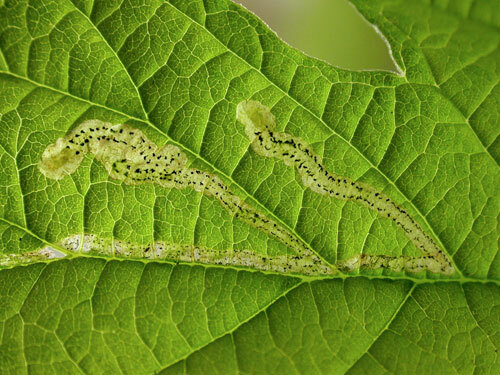 Not infrequently the larvae gets stuck to the leaf after having left its mine, and thereby even in these species sometimes a puparium can be found in the field. In species that pupate inside the mine, the puparium can mostly be found under-side. Puparia can also be obtained by storing the mines for a few days in a cool place or fridge in a plastic bag. Colour, sometimes also shape of the puparium are diagnostic characters, and sometimes this procedure is necessary to come to a definite identification. The larvae often are of crucial importance for the identification. Their morphology is discussed by, among others, Allen (1957a), Dempewolf (2001a) and Frick (1952a). It is important to study the largest larvae, those in their third instar; younger larvae may be different. Without going in too many details a few characters need to be discussed. The mandibles are very close together and bear a variable number of teeth, mostly two. They are flexibly attached to a system or chitinous beams, together known as the cephalic skeleton. In the subfamily Phytomyzinae this cephalic skeleton has two arms that point rearwards. In the other subfamily, the Agromyzinae, the upper of these two arms is considerably widened, with a strongly chitinised upper and lower rim, and an almost invisible, membranous area in-between. In practice this comes down to the observation that in Agromyzinae there are three rearwards pointing arms. Usually, but by no means always the two mandibles are of equal size in the Agromyzinae; when they do differ in size, mostly the left one is the largest. Size difference is the rule within the Phytomyzinae, with the right mandible the largest. When the mandibles differ, they are shifted in position (they ‘alternate’): seen from the side one sees then the teeth of both mandibles at the same time, easily giving a false impression of a double number of teeth. 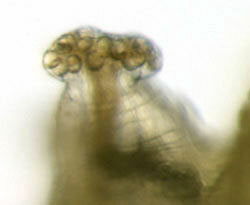 The shape of the spiracula and the papillae on top of it can vary appreciably. The number of papillae ranges from the basal number, three, up to over twenty. They usually are arranged in a circle or oval, but the papillae-bearing part of the spiraculum may also be elongated or bifurcated. 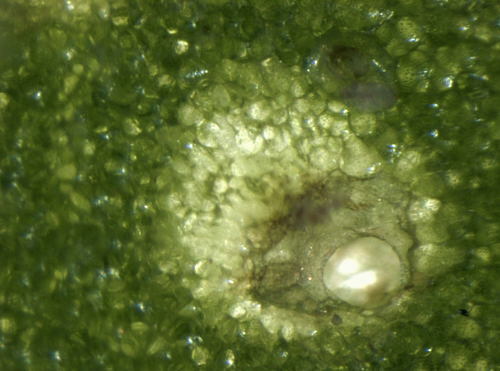 Among the species that pupate within the mine often one of the two pairs of spiracula penetrates the epidermis; mostly the anterior pair is involved. This happens in particular in the genus Chromatomyia, but for instance also in Phytomyza ilicis. The spiracular horns can be seen with a loupe, but also be felt with the fingertips. Mines, attributed to Agromyzidae are known from the early Tertiary of North America and Europe (Winkler ao, 2010a). Allen (1957a), Bethke & Parella (1985a), Dempewolf (2004a), Frick (1952a), Keilin (1921a), Parella, Jones, Youngman & LeBeck (1985a), Winkler, Mitter & Scheffer (2009a), Winkler, Labandeira, Wappler & Wilf (2010a).